As the Great War fitfully starts in the Austrian Empire, we are introduced to our hero, Svejk, who has been “finally certified by an army medical board as an imbecile.” Reconscripted despite his rheumatism (and certified imbecility), we follow Svejk in his progress through a loonybin, an army brig, a prolonged anabasis through Bohemia, and his incarceration as a Russian prisoner of war. 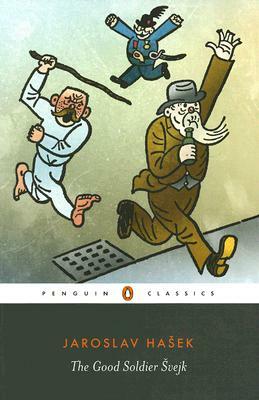 Practically all of Svejk’s actions precipitate chaotic, if not downright catastrophic results; nevertheless, Svejk will endure because, while he may be an imbecile, he is most certainly nobody’s fool. Good-natured and garrulous, Švejk becomes the Austro-Hungarian army's most loyal Czech soldier when he is called up on the outbreak of the First World War - although his bumbling attempts to get to the front serve only to prevent him from reaching it. Playing cards, getting drunk and becoming a general nuisance, the resourceful Švejk uses all his natural cunning and genial subterfuge to deal with the doctors, police, clergy and officers who chivvy him towards battle. The story of a 'little man' caught in a vast bureaucratic machine, The Good Soldier Švejk combines dazzling wordplay and piercing satire to create a hilariously subversive depiction of the futility of war. Cecil Parrott's vibrant, unabridged and unbowdlerized translation is accompanied by an introduction discussing Hašek's turbulent life as an anarchist, communist and vagranty, and the Everyman character of Švejk. This edition also includes a guide to Czech names, maps and original illustrations by Josef Ladas. Jaroslav Hašek (1883-1923) Besides this book, the writer wrote more than 2,000 short works, short stories, glosses, sketches, mostly under various pen-names.